Do you want to surprise everyone on a Minecraft PE server with your unusual look? Only nickname is a difference from vanilla mobs, the other parameters are exactly like the original creatures. That is, your height, width, body parts will exactly copy the original model. 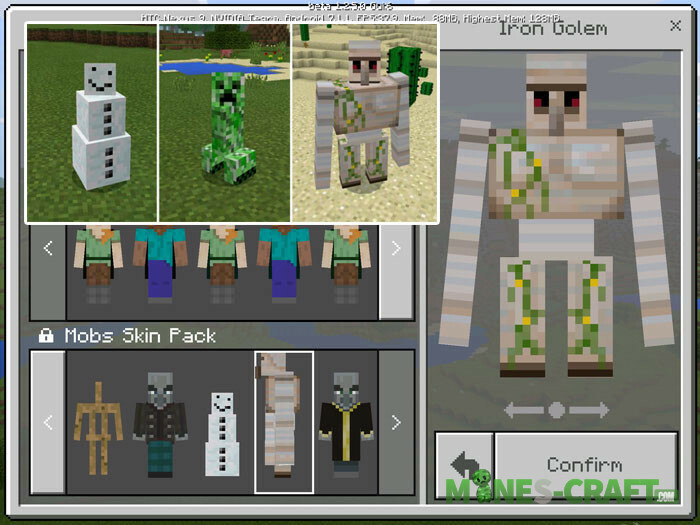 Do not forget, both single and multiplayer mode support these skins, so if the nicknames are disabled then you will be impossible to distinguish from the mobs. Download the pack and open it via MCPE. Go to the skin menu and select any of the presented skins. Requires Minecraft Bedrock Edition 1.2.5.
are u Sirius? u need Minecraft: pocket edition 1.2.5!